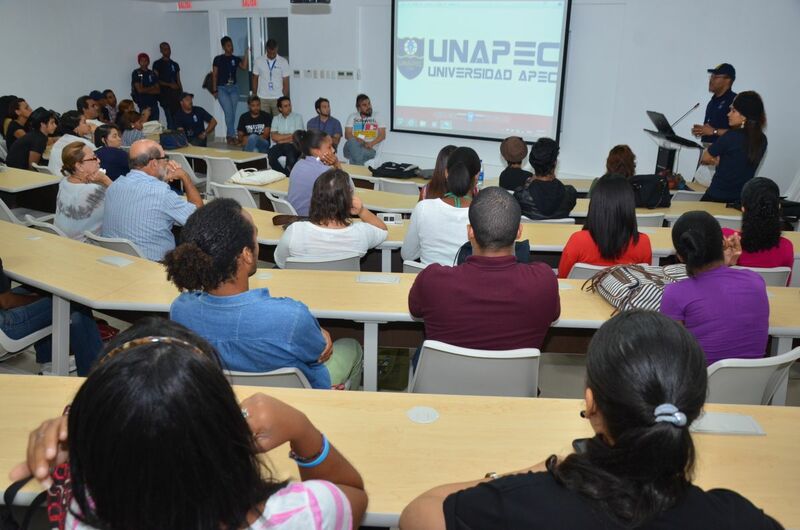 Four of the participants in the contest held at the Dominican Global Film Festival, which in this 7th edition expands the scope of the short film competition to the international level, shared their experiences with Apec University students. (Santo Domingo, November 15, 2013) Adapting to the conditions and tools you have on hand, falling in love with your project, being open, daring to make mistakes and collective work were all some of the points that were considered in deciding the finalists for the ”Global Short”. “Do not try to win an Oscar with the first thing you do,” recommended Paraguayan Osvaldo Ortiz Faiman, director of the short film And the Third Day. “The business of a filmmaker is not the movie itself but the process of making movies; you have to take on the risk of being wrong, you should set limits and surround yourself with people who have criteria that contribute to what you are doing,” he said. During the roundtable discussion held in the Conference Room of Apec Francisco Rojas, Director of Black Night, added that film is not like music or painting where you work alone. Film is the primordial collective work, and everything is structured based on the elements that you must adapt to your conditions. In the same way, fellow Dominican Carlos Garcia, Director of the Photographic Documentary The Postponed, added that patience and love for his project were determining points in its preparation. Meanwhile Puerto Rican Cristian Carretero, Director of the short Yolanda, said that in his short film he aims to show the sacrifice and struggle of his mother; he considers it necessary to work in contextualizing the story and design something feasible within the resources you have, in order to produce a good work. About the Global Short Contest: The Dominican Global Film Festival holds as its main objectives to become an international forum for the dissemination of film betting on the quality, new talents and emergent filmmaking. Global Short is a section devoted to new student values, amateurs or professionals with inroads into short audiovisual works of any type or genre (Fiction, Documentary, Experimental and Animation). “Global Short” encourages participation by directors who are within the age range of 18 to 45 years and who may present an unlimited number of short films competing for various prizes during the closing of the Dominican Global Film Festival. For the first time the FCGD will consider an Audience Award, which will be determined by a vote on the festival website www.festivaldecineglobal.org.